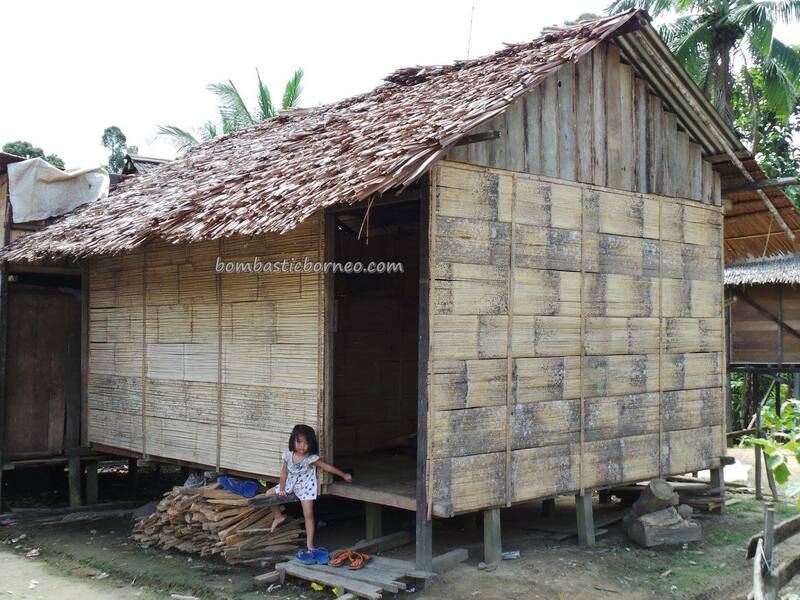 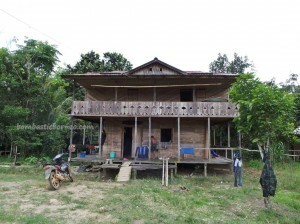 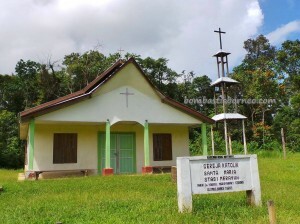 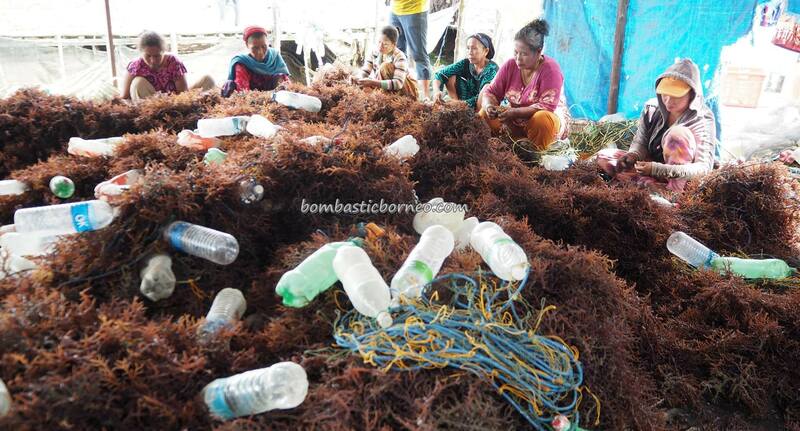 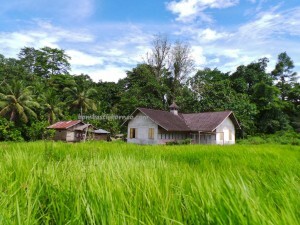 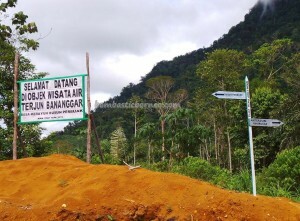 Location : Kecamatan Air Besar, Kabupaten Landak, Kalimantan Barat, Indonesia. 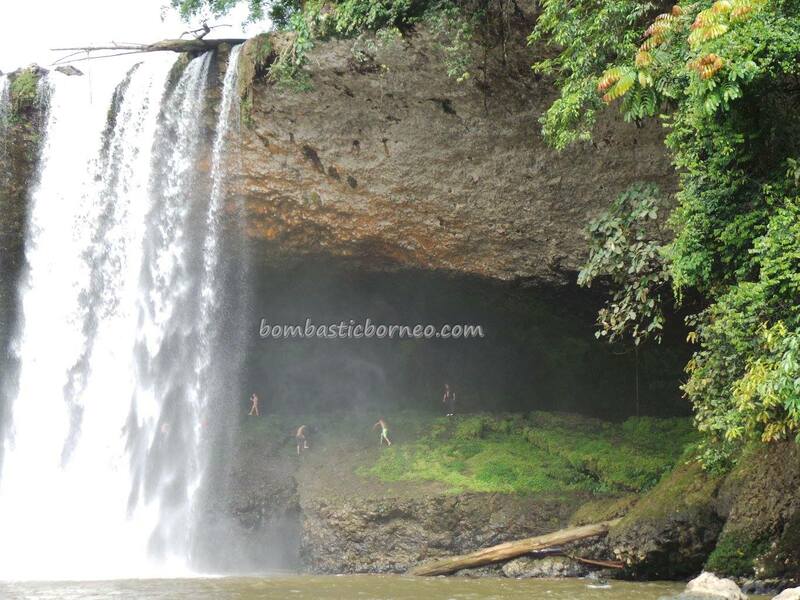 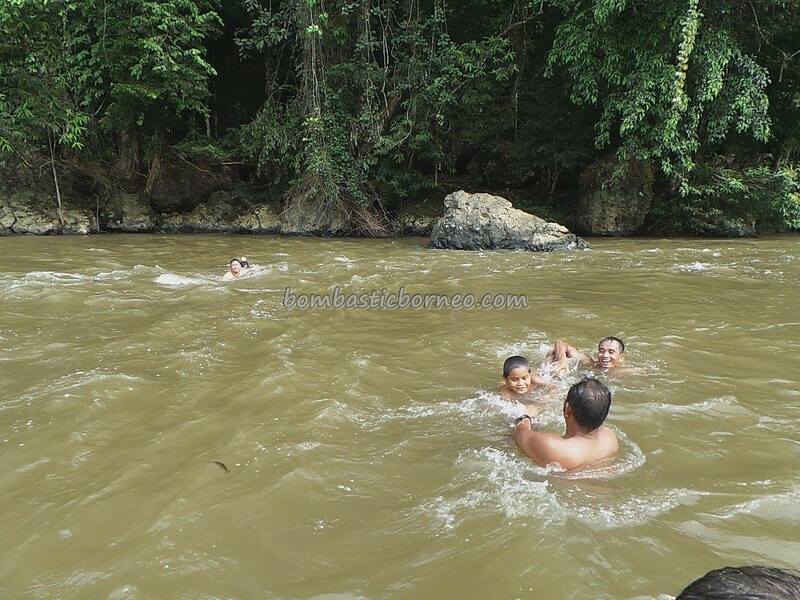 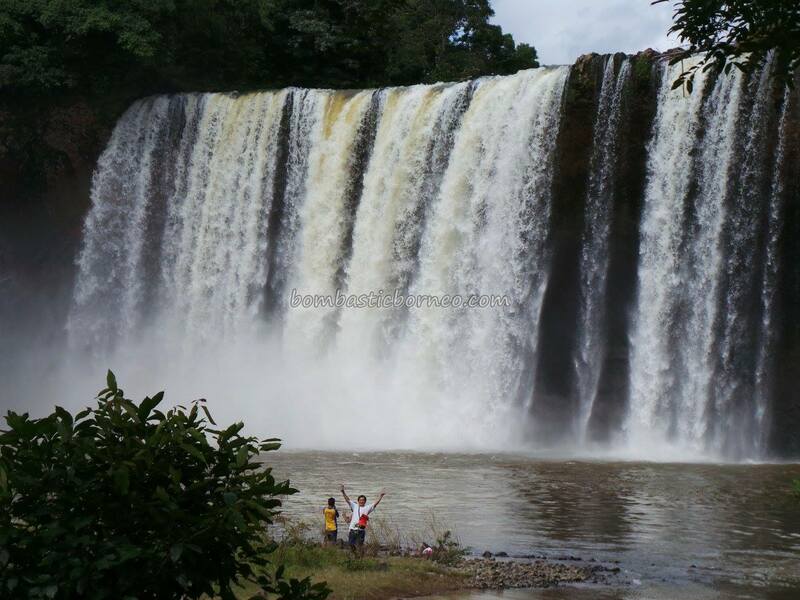 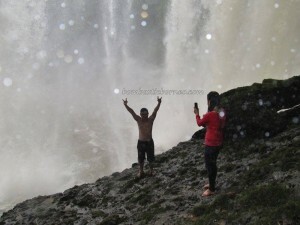 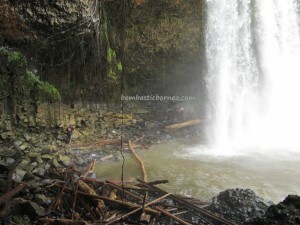 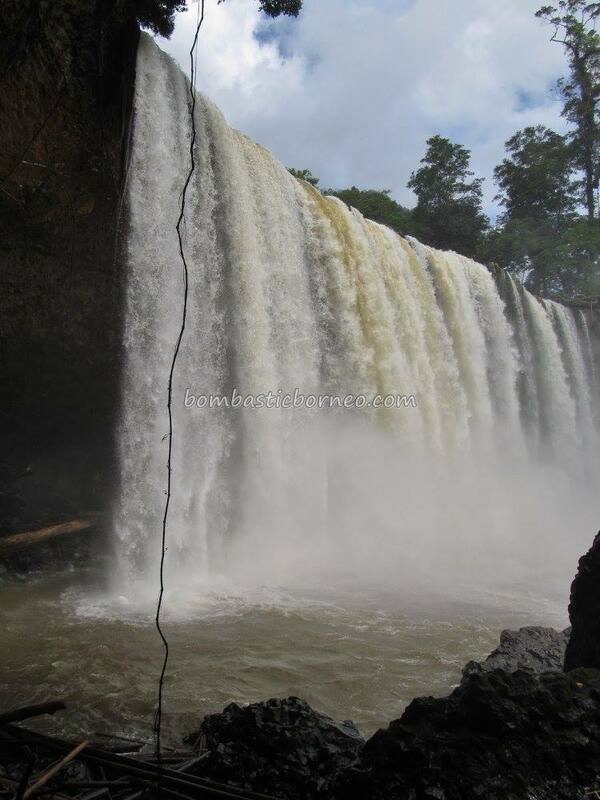 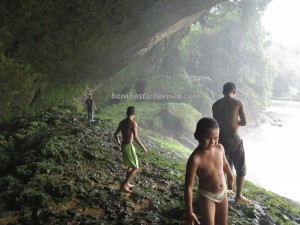 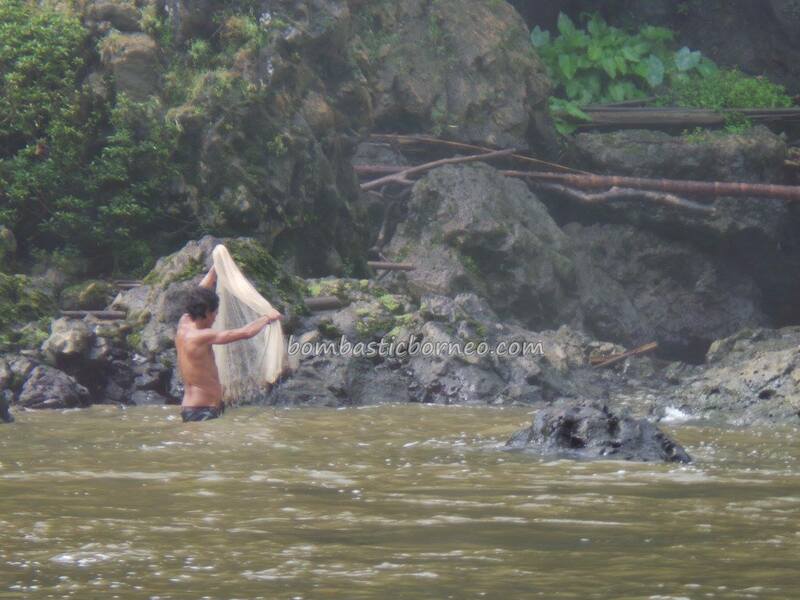 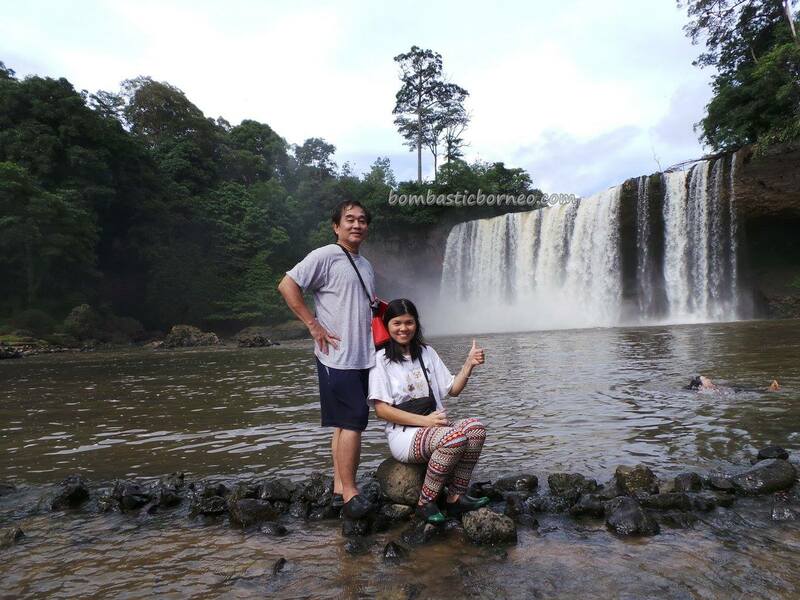 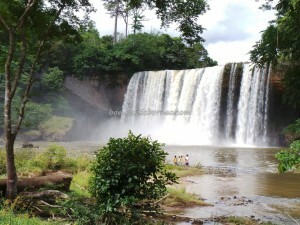 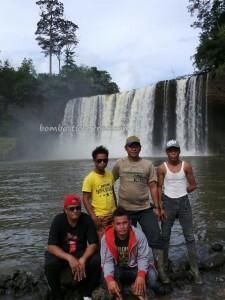 Bananggar waterfall is the largest waterfall in Landak District, with a width of 60 meters and a height of 60 meters. 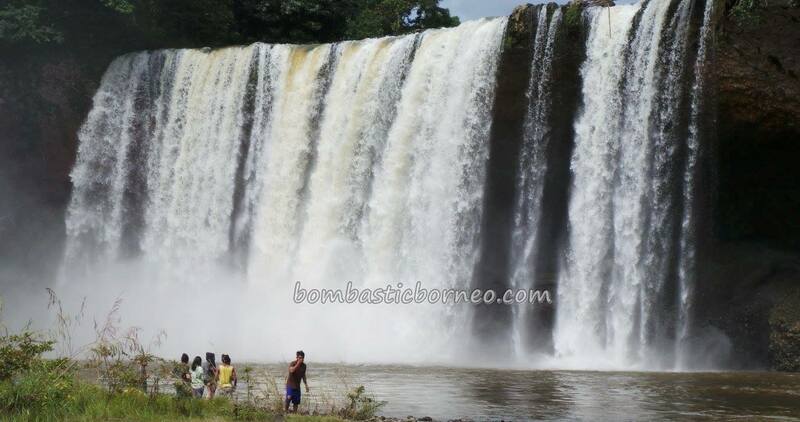 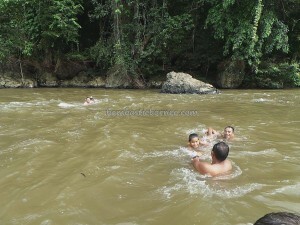 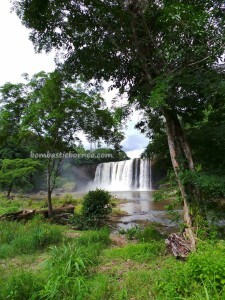 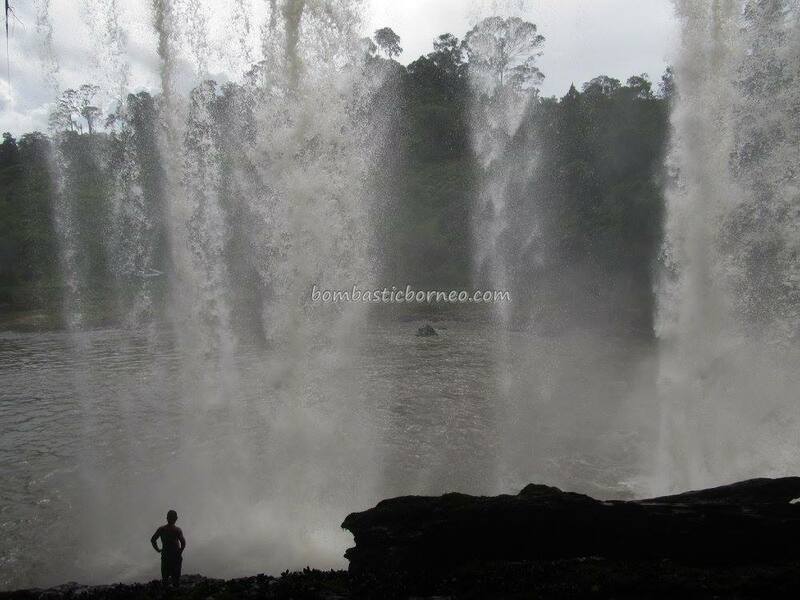 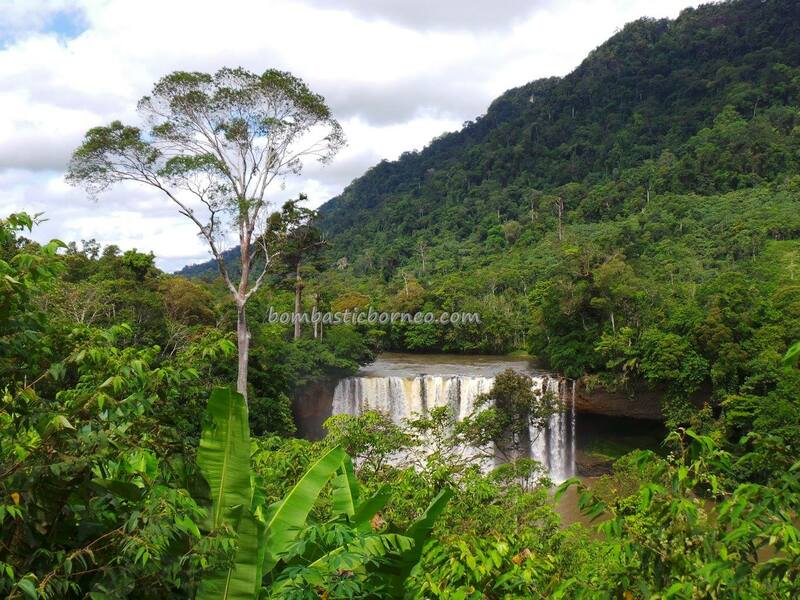 If you presently search online about this waterfall the page would be cluttered with Trip Advisor’s repetitive write up by someone who visited this waterfall via Pontianak to Ngabang to Serimbu to Kampung Tauk and finally to Bananggar Fall. Doable on a day trip. 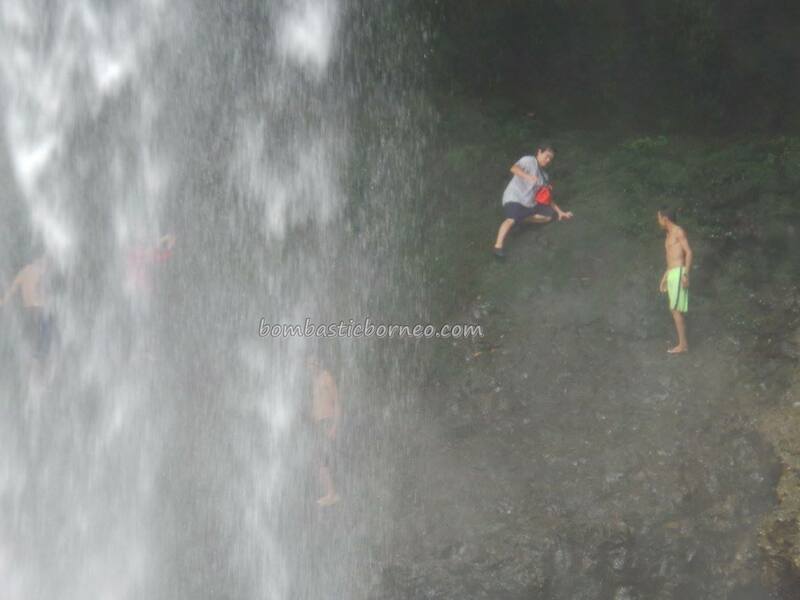 It would be safe to call this the ‘front door’ way to this spectacular fall. 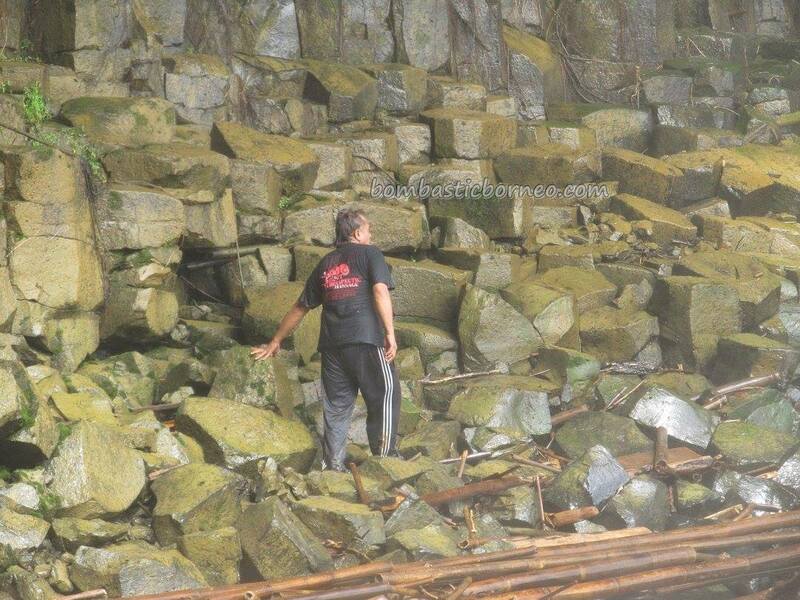 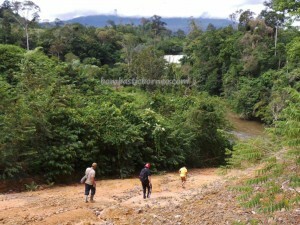 Since we were coming in from Kuching Sarawak, it would only make sense to do it the ‘back door’ way. 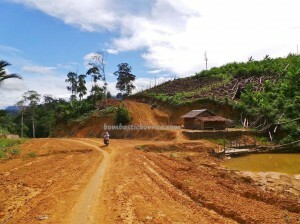 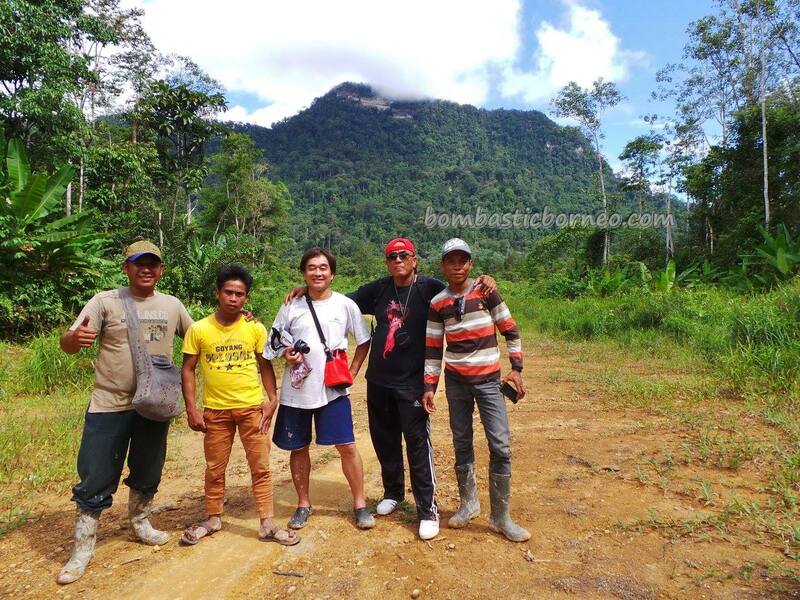 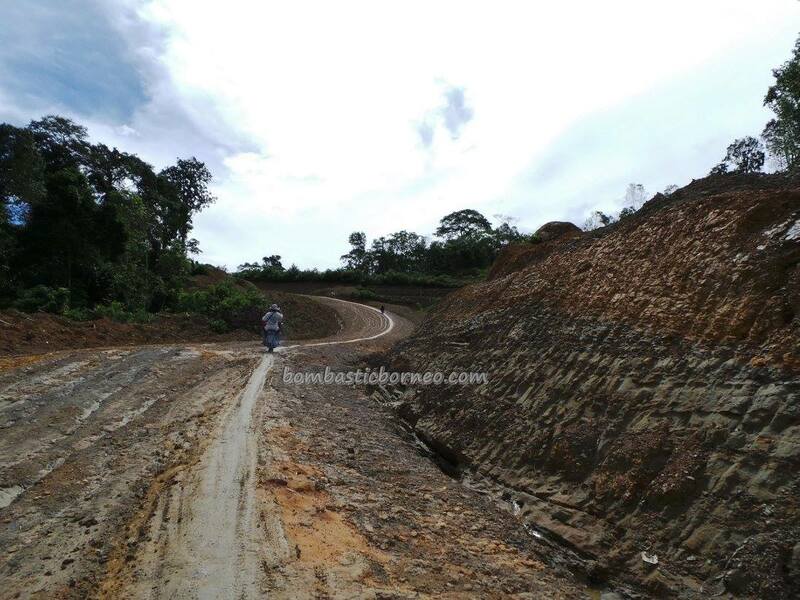 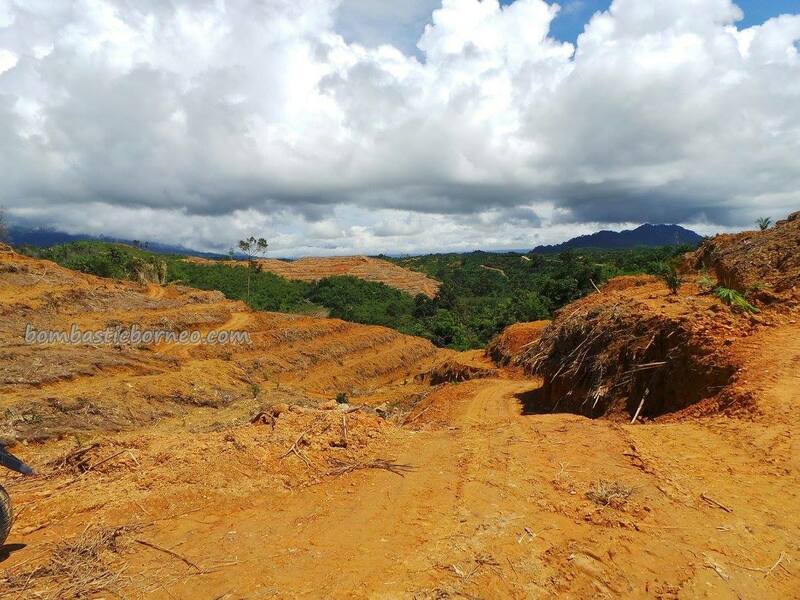 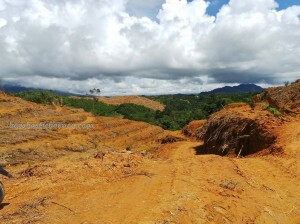 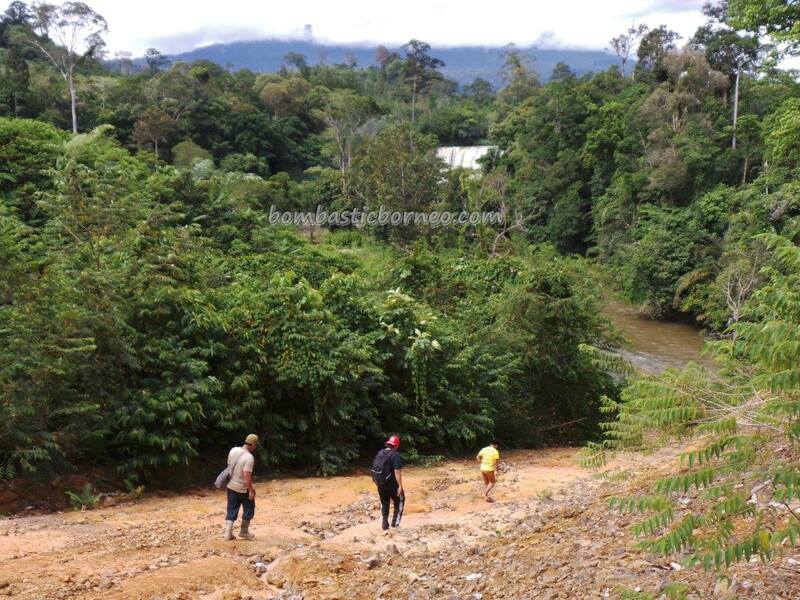 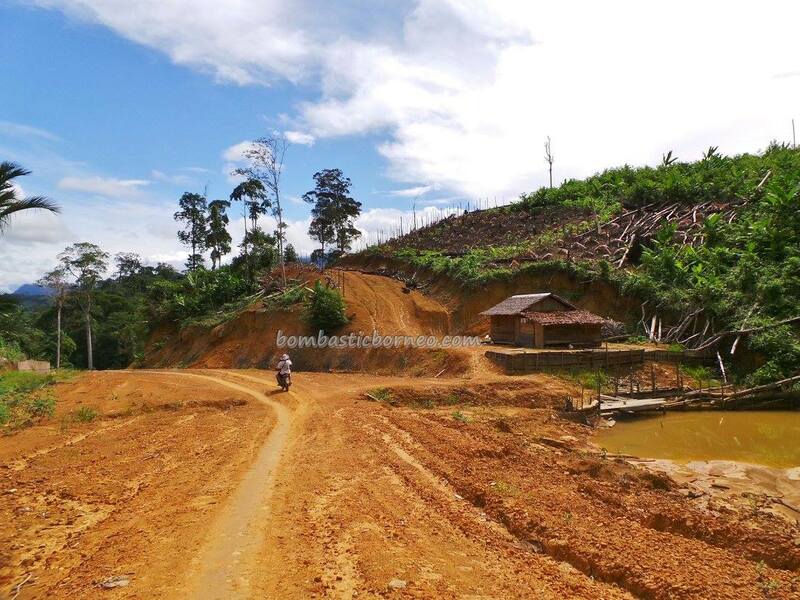 By entering from Tebedu/Entikong border post and driving though Kampung Sontas’ narrow and sometimes very rocky road towards a never ending hilly up coming oil palm estate. The dirt road here is narrow, long and winding like a roller coaster. 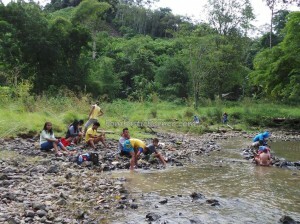 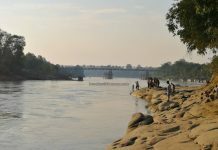 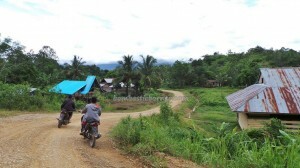 It provided a scenic view of the landscape here of Landak district. 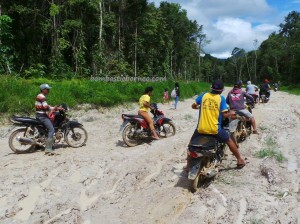 Many sharp bends and blind corners such that I had to continuously honk all the way through this plantation. 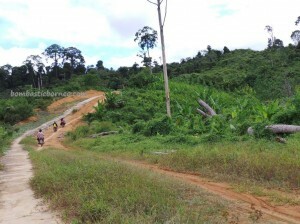 I couldn’t complain for it provided quite a drastic short cut to my intended destination. 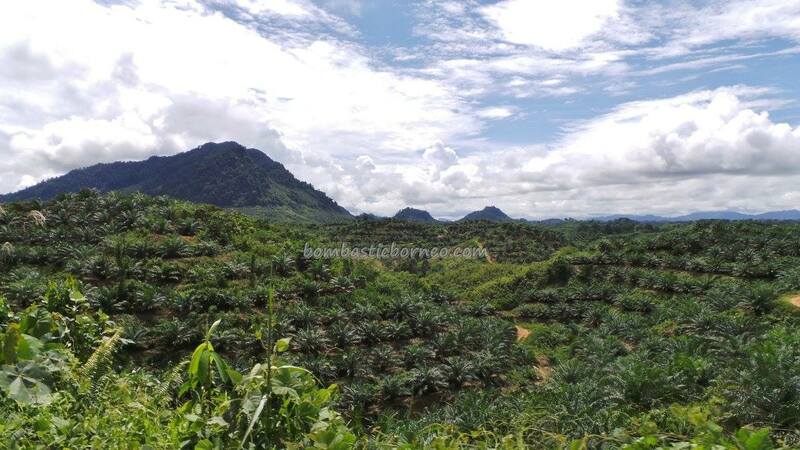 There are no signage in the oil palm plantation. Only the locals know which junction to take and in our case Pak Anton’s wife who hails from Kampung Entuai and tagging along was our only source of direction. 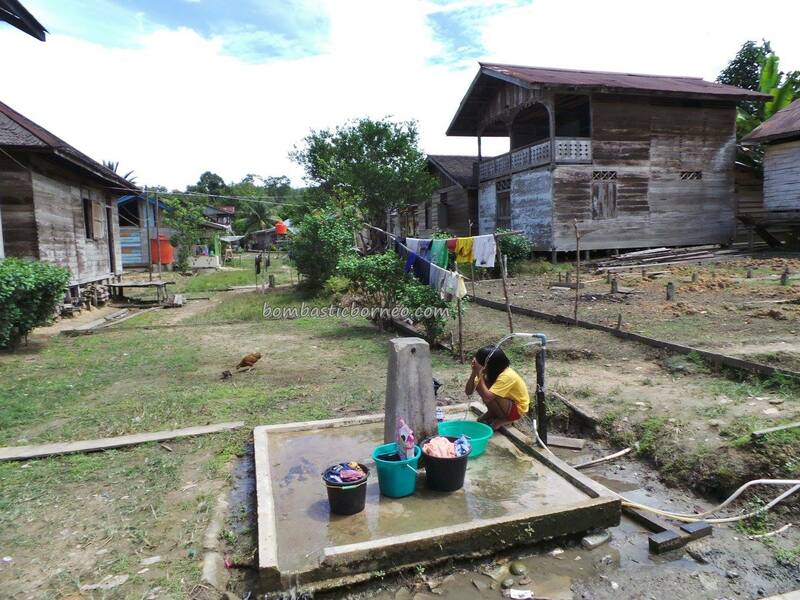 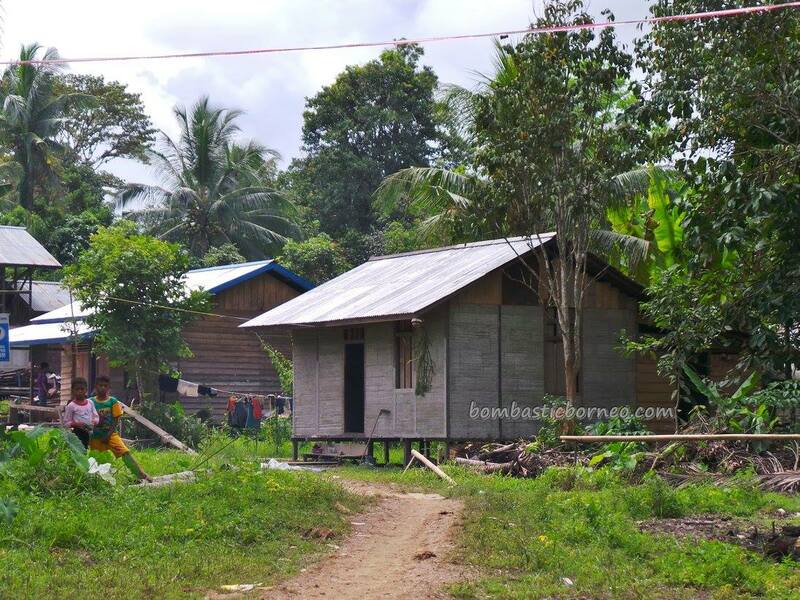 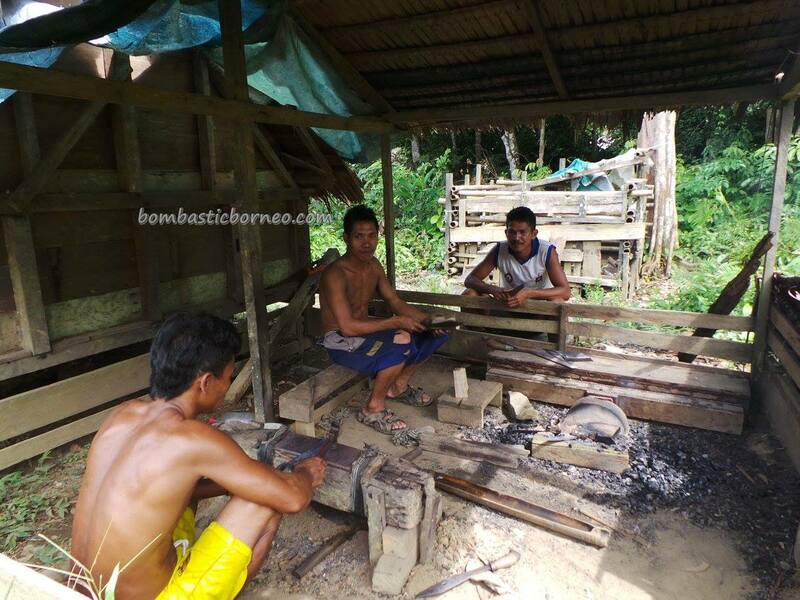 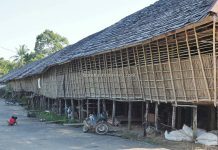 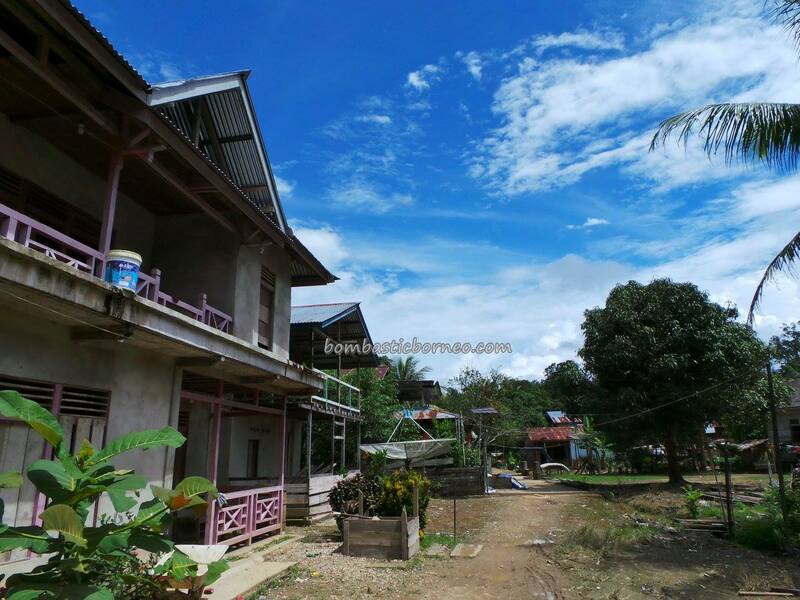 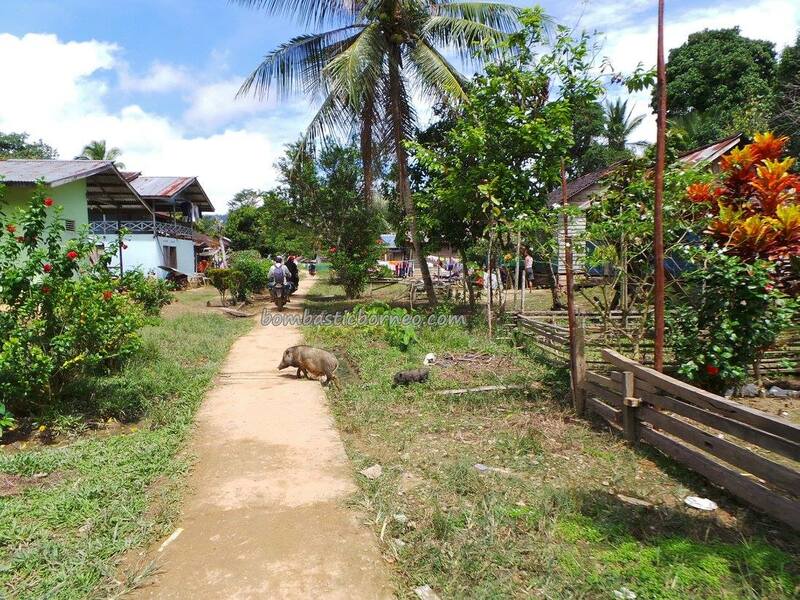 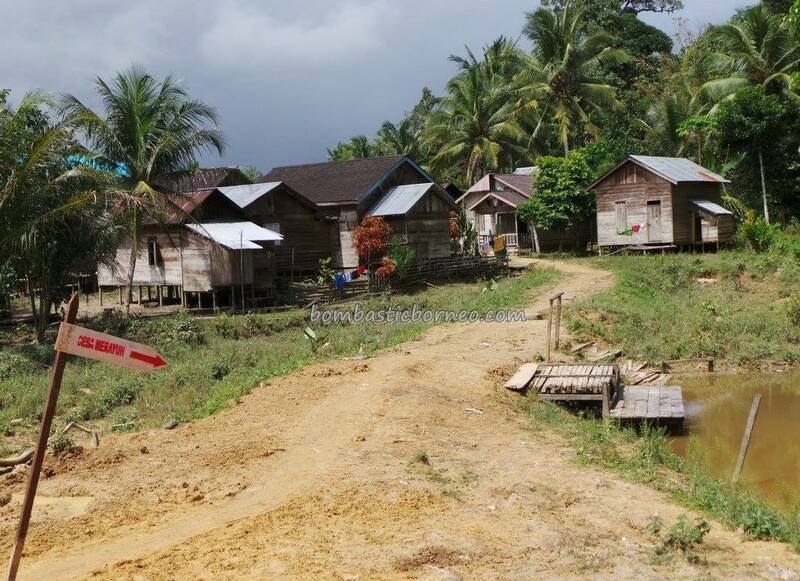 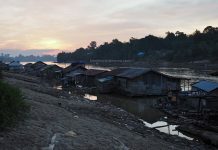 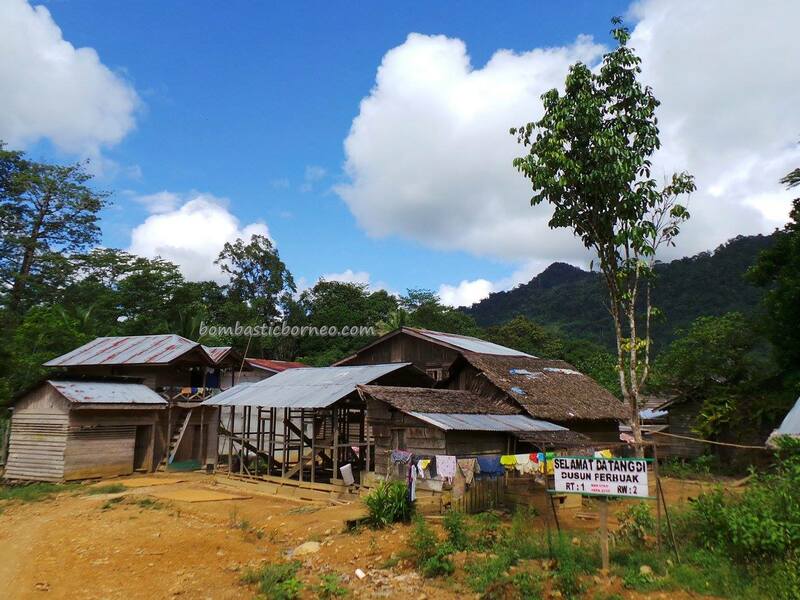 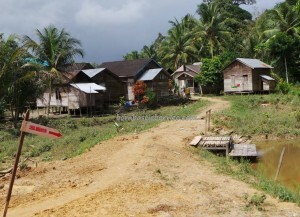 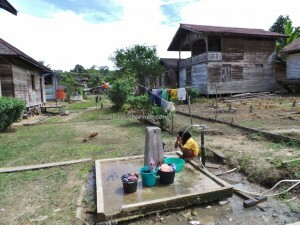 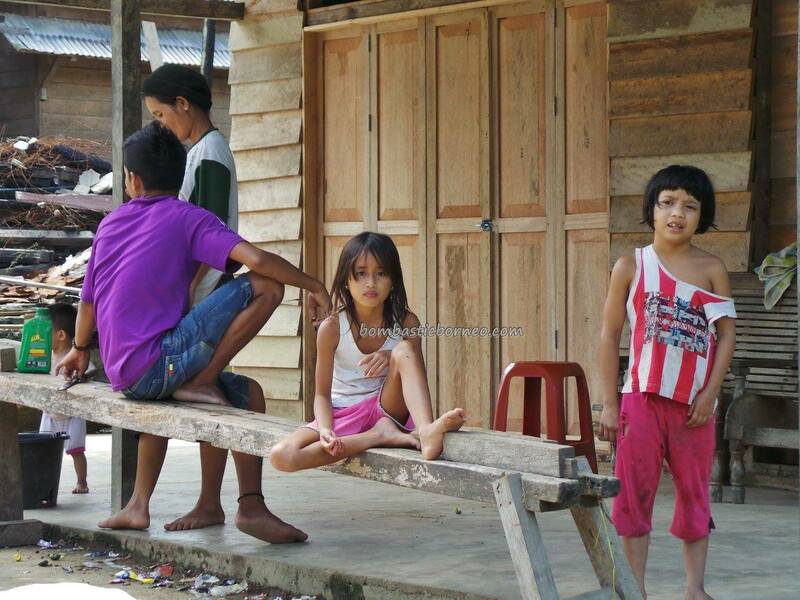 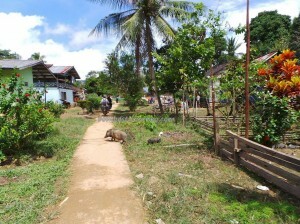 Kampung Entuai, a relocated village, was the last village and the farthest that our car could bring us. 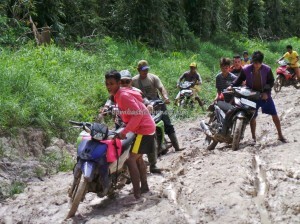 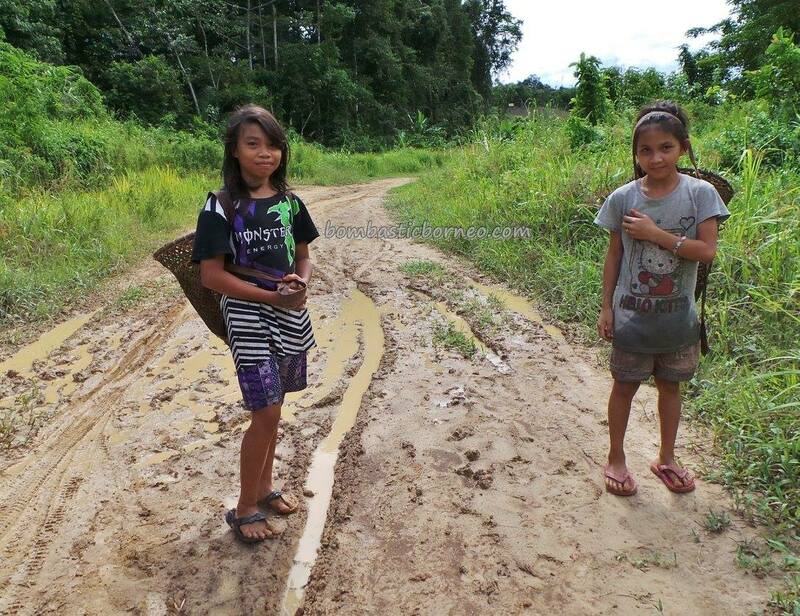 The rest of the journey had to be done by ojek through muddy tracks. Sometimes getting off the bike and helping push it through. 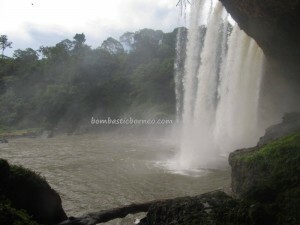 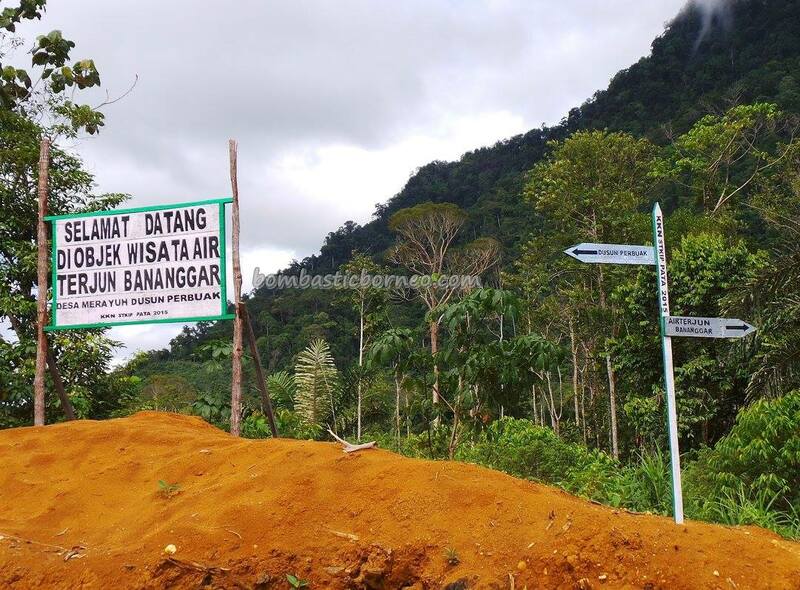 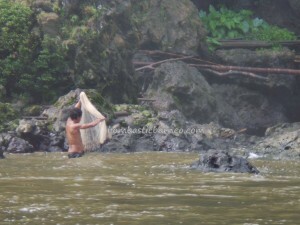 We had to pass through 5 other villages namely Nyari, Batu Baru, Anyang, Merayuh and Perbuak before catching sight of the beautiful Bananggar fall from the road side. Using teritiak as moulds for these wall panels turn out to be a brilliant idea, very special effect. 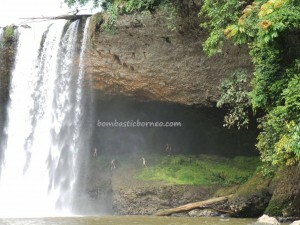 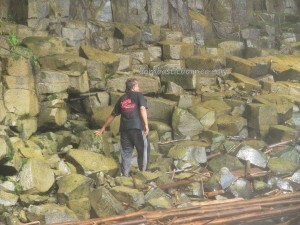 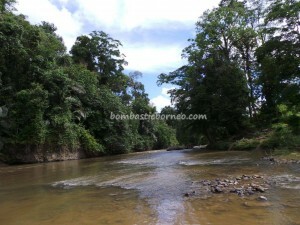 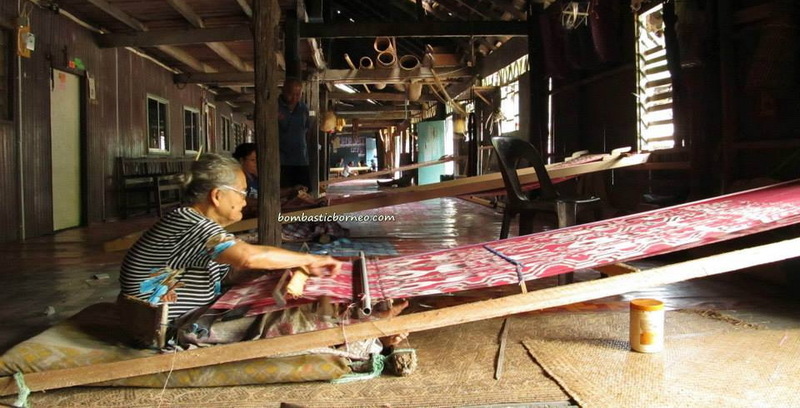 Day trip by bike from Kuching to Bananggar Fall is possible during the dry season here which is around August. 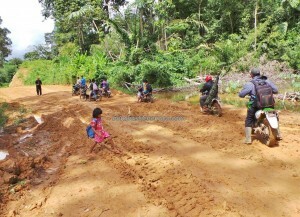 Engage a guide with a bike at the Entikong checkpoint. 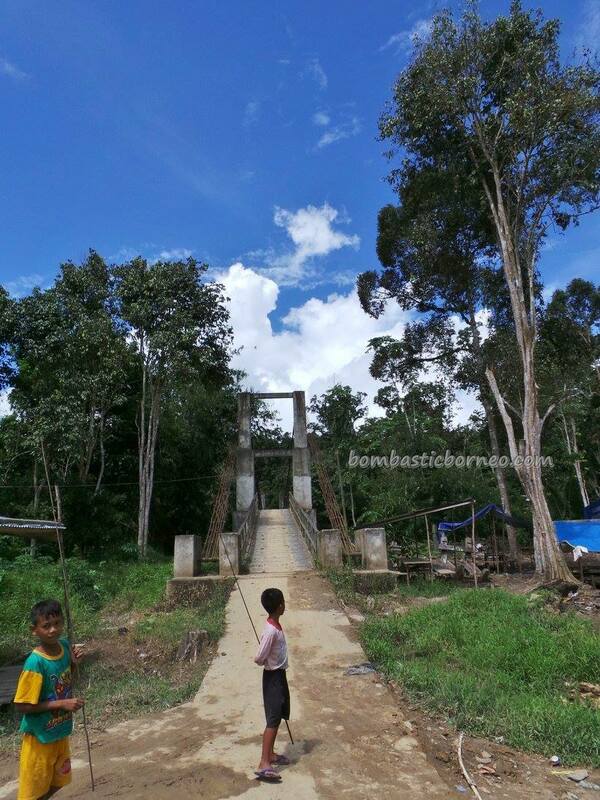 Make sure you make it to the border before the gate closes at 5pm Indonesian time or 6pm Malaysian time.